WheelTurnerHawaii.com: 2013 - 2014 HawaiiWinterOutlawSeries Event 1 - The 3rd annual Hawaiian Ridge Rusher. 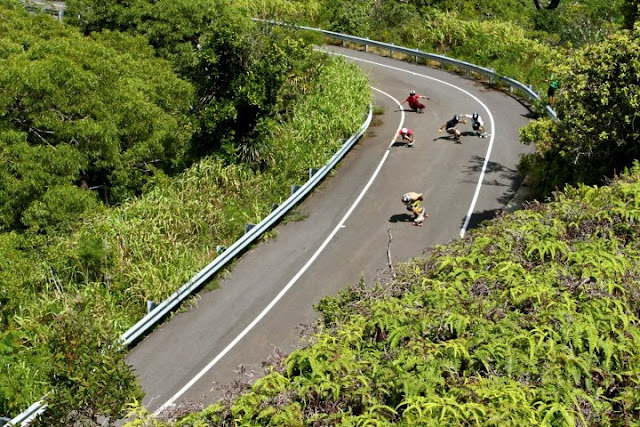 2013 - 2014 HawaiiWinterOutlawSeries Event 1 - The 3rd annual Hawaiian Ridge Rusher. September is HERE and we are getting ready for the Hawaii Winter Outlaw Series event 1, The Hawaiian Ridge Rusher 3. For those who came out to jam in the past, it will be at the same spot you all love. For those who missed out last year... the course is a fun 30ish MPH run complete with several up's n down's along with a few left's n right's. No hands are needed for any of the turns, but a good tuck and riding strategy will help take ya to the top! To keep things tight knit ,the location and meet up info will be given to you upon registering. WE WILL BE CAPPING THIS EVENT AT 40 ENTRYS FOR THIS EVENT. First come first serve. We are trying our best this year to keep the jam's mellow and fun for all like always. These are sessions where friends can turn wheels and have fun together. To keep them going, we need to keep respectful to those in the area of the jam... there for we can't be blowing up there area. To register please email StokedSkaters@aol.com. Include your Name, age, email/phone number and which event you are signing up for. When you receive a confirmation email you are IN! All information on where and when to meet on the jam day will be included in the email. All $15 entry fee's will be collected on the day of the race. Please don't send your name in for registration and not show up, If this happens more then once you will no be allowed to enter the next HWOS event. If you have sent your name and can not make it, please email to let us know. IF ALL SPOTS ARE NOT FULL, we will accept entry's to fill the brackets the day of the race for $5 extra. Please check back to the site within 2 days of each event to see the status on entrys. For those who know where the course is, we ask that you please keep from riding it the week or two before the event. Also, this is a SKATERS ONLY event... please don't bring any spectators. We don't want to overwhelm the people in the zones we are cruising at. BIG MAHALO's for taking the time to read this. Please remember to send in your name if you want to make it out. See everyone on Sep 14th. 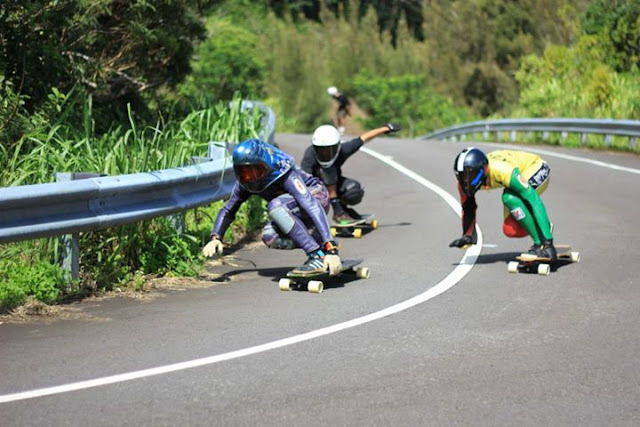 Hawaii Winter Outlaw Series Event #1: The Hawaiian Ridge Rusher II from Evan Higa on Vimeo. Hawaiian Ridge Rusher 2 from Sk808 DH on Vimeo. HawaiiWinterOutlawSeries Event 1 - Course Run Down. from Mackenzie Yoshida on Vimeo. Course Run Down from a few years back, Don't pay attention to the event info in the video. This will however be the same course for this year... study up!